10:          <Button Name="MyButton" Content="Click Here"
The code is fairly simple. Grid having two rows, one containing button control and other having a TextBlock. In the click of event of button, I have initialized a new thread. Assigned to that thread is method called “DisplayTime”. Inside “DisplayTime” method, I am assigning the current time to the textblock control. All in all , I am trying to update the UI from code which is running on a separate thread. Ideally the code should run fine but it doesn’t. It throws an exception of type :- InvalidOperationException. And following is the error message : The calling thread cannot access this object because a different thread owns it. The main method here is tagged with “STAThread” attribute. STA stands for “Single Threaded Apartment” model of programming. What STA states(or enforces) is that only one thread at a time will be executing our code and it will always be the same thread. All our Winform based application runs on STA model. Indeed one thread controlling the complete application looks like a big constraint and WPF people actually decided to move away from this model by opting an all together different approach. But the plan was abandoned because of various compatibility issues with other already existing applications. So our WPF applications too run on STA model. The thread the controls the application is commonly known as UIThread. “Dispatcher” concept is a mechanism introduced in WPF , with the help of which developer can have more explicit control on this UI thread as of what executes when. We will look into this in more details in the remaining section of this article. But before we take a deep dive, just try to keep in mind the below mentioned points about STA model. Thread that creates a given WPF application also own it and its not possible for any other thread to interact with these elements. In practice entire WPF application runs of single thread and its this thread that owns all the elements in the application. As the name implies, the dispatching system is responsible for listening to various kinds of messages and making sure that any object that needs to be notified of that message is notified on the UI thread. 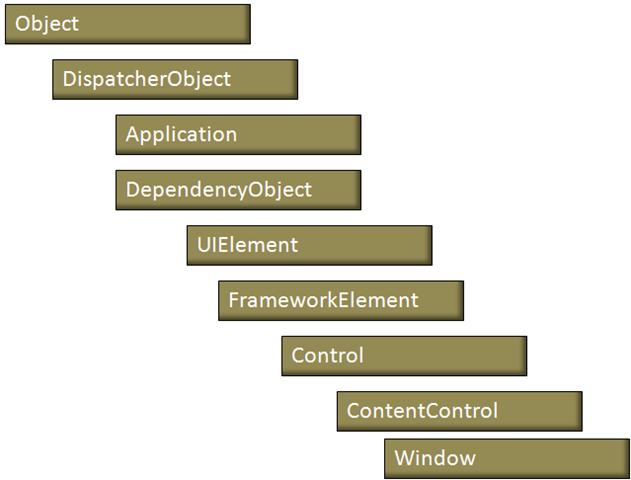 From the above picture its evident that almost every single entity in WPF derives from the “DispatcherObject” class. Following is the internal implementation of “DispatcherObject” class. “DispatcherObject” class offers a public accessor property called “Dispatcher” using which we can access the current instance of “Dispatcher” class. Speaking about “Dispatcher” class, it is responsible for managing the work that takes place in our WPF application.Its this class which owns the application thread and internally it maintains a queue of work items. As the WPF application runs , Dispatcher class accepts incoming requests and executes them one at a time. In short dispatcher is an object which receives messages and delivers it to the correct object for further processing. Dispatcher class is pretty dense with lots of properties and methods. Going into the depth of Dispatcher class is beyond the scope of this article. One final thing on dispatcher class is that a given application can have only one instance of dispatcher class( as the application runs on single thread) , so Dispatcher class implements the very famous “Singleton” pattern. Because of that its impossible to create an instance of Dispatcher class in our custom code. Only with the help of public property “Dispatcher” offered by “DispatcherObject” that we can invoke members defined inside the “Dispatcher” class. Dispatcher class is instantiated as soon as any class which derives from “DispatcherObject” is accessed. All further request are processed by this newly created instance. Coming back to “DispatcherObject” class , it offers two methods namely CheckAccess and VerifyAccess. CheckAccess : Determines whether the calling thread has access to this DispatcherObject. Only possible return values are true and false. VerifyAccess : VerifyAccess is more stringent compared to CheckAccess. It checks whether the calling thread is the one which created the DispatcherObject. If not it throws “InvalidOperationAccess” exception. Getting back to the example which I gave in the beginning, in that we were trying to update the UI through code which was running on a different thread. Internally VerifyAcess is invoked and once it verifies that calling code is different from the one which controls the application, it throws the “InvalidOperationError” exception. I have spoken so much on the classes which enable dispatching scenario in WPF. But at the end of the day WPF works on STA model. So how does this whole “Dispatcher” stuff going to help us ? As mentioned before , Dispatcher maintains an internal queue of work items and it process each work items one after the other. Each work item in the queue is has its associated priority. Items are executed relatively to each other on the basis of their priority values. Items with high priority value will be executed before any other items with low priority values. Possible values for the priority field is represented by an enum called “DispatcherPriority”. before executing the delegate that loads the data. This allows the control or window to be displayed and rendered immediately, whilst the data waits in the background to be loaded. Proper use of threads can greatly increase the responsiveness of your WPF applications. Unfortunately, you can’t update any UI controls from a thread that doesn’t own the control. In .NET 2.0, you used Control.Invoke(). Now, we’ve got something similar but more powerful – the Dispatcher. This tutorial will explain what the Dispatcher is and how to use it. First of all, you need to know where the Dispatcher lives. Every Visual (Button, Textbox, Combobox, etc.) inherits from DispacterObject. This object is what allows you to get a hold of the UI thread’s Dispatcher. So the question is, how do you update the Checkbox from this thread? Fortunately, the Dispatcher gives us the ability to Invoke onto its thread. Invoking probably looks really familiar if you’ve programmed in .NET 2.0. We actually have an in-depth tutorial on invoking that you might want to read. Below is code using the Dispatcher that will run and update the Checkbox without throwing an exception. Now we’ve introduced the Dispatcher object. The call to Invoke needs to take a few pieces of information. First is the priority you’d like your work executed with. Next is the delegate that contains the work you actually want to do. If your delegate takes parameters, the Invoke call will also accept an Object or Object to pass into the delegate function. It will also accept a timespan that limits the amount of time the Invoke call will wait to execute your code. The call to Invoke will block until your function has been executed. Depending on the priority you’ve set, this might take a while. The Dispatcher also has the ability to invoke code asynchronously using BeginInvoke. Let’s look at the same example using BeginInvoke. BeginInvoke takes many of the same arguments as Invoke, but now returns a DispatcherOperation that lets you keep track of the progress of your function. In this case, I simply hooked the Completed event that notifies me when the work has been completed. The DispatcherOperation object also lets you control the Dispatcher by changing its priority or aborting it all together. Unfortunately, there’s no way to determine if the invoke finished or timed out from the outside. You can always put code inside the invoked function to determine if it executed. All right, so we’ve got our dispatchers working and code is being executed where it’s supposed to be. Invokes, however, are kind of an expensive process. What happens when your controls are being updated from both external threads and the main UI thread. How do you know if you’re supposed to use Invoke? The Dispatcher object provides a function that tells you whether or not you have to use Invoke. In WinForms you call InvokeRequired on the actual control. In WPF, you call CheckAccess() on the Dispatcher object. CheckAccess() returns a boolean indicating whether or not you can modify the control without Invoking. So now, before I invoke, I check to see if I even need to. If I do, I invoke the function, if I don’t, I simply update the control directly. As you can see, the Dispatcher provides a great deal of flexibility over the WinForms Invoke. There’s a lot about WPF’s dispatching model that we didn’t touch in this tutorial. The System.Windows.Threading namespace contains a lot more useful objects that extends the power of the dispatcher even further. If you’ve got questions or have found crazy uses for the Dispatcher, leave them in the comments.